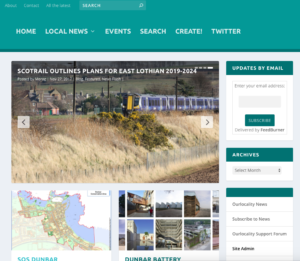 All the news from websites hosted on the Our Locality platform will appear here immediately, but only once published. If you are a new site owner, you will need to select the first Privacy option in Settings > Reading before your news will appear here. While your document is in draft or tagged “private” it will not appear here. To remove an article from the new stream, you can make it draft, private or delete it. You can also make an article sink out of view, by setting a historic date. There are a couple of gotchas: 1) we spin the headline of every post out to twitter (there is a fifteen to thirty minute delay, so don’t panic); 2) we cannot stop search engines caching your pages, so even if you delete a page – it may be out there for some time. Only posts (blogs, events, news or whatever you categorise it as) will appear here. If you want your news to be seen, remember to set a featured image, use a snappy title that can be read and understood out of the context of your own website, and to categorise and tag it appropriately (in other words do not over do it – one category and a handful of relevant tags). This creates a richer and more accessible and user friendly archive for all our users. Within 15 to 30 minutes every post that appears on news.ourlocality.org is spun out to twitter and facebook. If you make a mistake and publish something that has to be withdrawn or you regret, get in touch and we’ll delete the twitter and fb snippets and links. Your Pages will not be published here, so you can create as many as you like without them appearing in the news stream. Special content types, e.g. Projects if you have a Portfolio theme are not published here. If you want people to find Pages and Projects or you are refreshing a site’s content, always write a news story or more about it, avoiding copy pasting the content as that will look like repetition. Use long form – if not you should probably be using facebook or twitter. That said you can utilise any number of post template types, to make your site look more like a social media profile. Use the featured image facility, avoiding sprinkling images through the content which from our experience people struggle with. If you have tons of images, please call us – we are not an image storage service!